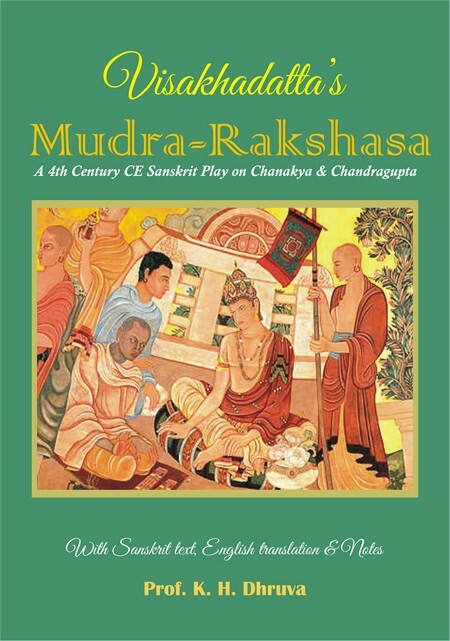 The Mudrarakshasa (“Signet Ring of the Rakshasa,the chief minister of the last Nanda king”), a historical play in Sanskrit by Vishakhadatta (4th century CE) narrates the ascent of the king Chandragupta Maurya to power in Northern India with the aid of Chanakya, his Guru and chief minister. Storyline: Chanakya, minister of the king Nanda (Dhana Nanda), allies himself with Chandragupta in the latter’s plans for usurpation and is forced out by the king. Chanakya’s pact with king Parvata from the Northwest ensures his victory over Nanda. Parvata and Chandragupta divide up the old possessions of Nanda. Next, Parvata dies poisoned by a youth and his son Malayaketu succeeds him. Malayaketu, together with Rakshasa, the last minister of Nanda, demands the inheritance of all the old territories of the Nanda. The drama begins when Malayaketu and his allies (the kings of Persia, Sind and Kashmir) are poised to attack Pataliputra (present day Patna), the capital of Chandragupta. The outcome arrives when Chanakya, by the use of guile, manages to attract Rakshasa to the Maurya side, thus undoing the coalition of Malayaketu. The historical authenticity of the Mudrarakshasa is somewhat supported by the description of this period of history in Classical Hellenistic sources: the violent rule of the Nanda, the usurpation of Chandragupta, the formation of the Maurya Empire, and the various battles with the kingdoms of the Northwest resulting from the conquests of Alexander the Great. Thanks for this book. I have linked to this book from the Wikipedia article, along with several other editions that I searched and found were available online. oh really !! Are there no evidences ??? Alexander came not during Maurya’s rule but during chandragupt of gupt dynasty rule.Please correct. Do you know Indian History? Please understand Prudhvee sagar.Chandragupta mentioned in this book is Chandragupta maurya.He does not belong to Gupta dynasty.He belongs to Maurya dynasty. Alexander came during Nanda dynasty but didn’t cross river beas due to many reasons. He employed one Mr. Selucas to look after these conquered territories in India including those in present day Pakistan and afghanistan as Governer. Chandra Gupta Maurya with the help of Chanakya toppled the Nanda Dynasty and started Mourya Dynasty. eventually Chandragupta Maurya defeated Selucas and married his daughter. Alexander india invasion was almost the period of Chandragupta Maurya. These all happened before christ (BC) period. Gupta Dynasty period was in AD 4th century to 6th century. Do you really know the periods of Maurya and Guptas?u really need to know. Chandragupta mourya was the founder of mourya Dynasty. If you need any book, why don’t you request for it instead of asking questions? I request that please upload in Hindi also. Is it written by Bharatendu Harishchandra or just translated? Bharatendu Harishchandra translated it into Hindi from Sanskrit. Wasn’t there a movie that was made on this play? i need a detailed discussion on dis play Mudrarashasha!!! introduction_to_the_study_of_mudra_raksasa., 2020010005398. g_v_devasthali. 1948. sanskrit. NULL. 176 pgs. Is there any odia version or movie based on this?? when the real culprit appears and says that he should be hanged. I need malayalam transilation of mudrarakshasa ..
Mr. Dhanaraj in his work ‘The Nandas’ has raised a few interesting questions. His curiosity is to trace the origins of the Nandas who ruled this land before the Mauryas. Probably the land that they ruled was as vast as the area ruled by Chandragupta Maurya himself. The author has mainly relied on secondary sources and a few primary sources, such as Arthashastra and puranas. The book has three major parts. i.e, the community history, the lineage of Nandas, and their administration. Introduction carries the hypotheses wherein he has brought out the historical importance of barber community. He has tried to trace the history of barbers right from Indus civilization and tried to prove that how barbers could have been the first doctors as well. Subject calls attention when he says that Buddha was interested in bringing in cleanliness to Buddhist Sangha by introducing shaven face to monks. The women of barber community playthe role of midwives. The hindu society is unjust in candemning the profession of barbers who serve the society with humility. His attempt of tracing the birth of the Nandas from barber community in a way is an answer for stigma attached to the community. In order to prove his argument he has made use of certain clues and evidences found in puranas. One needs to go through wide range of original sources to prove such arguments. My interest here is not to prove or disprove the birth of Nandas to a barber family. But certainly this book makes us to think why it is important to dig in to the caste, religion, or linguistic background of a ruler. Why every now and then we keep getting into such arguments? Many a times it ends up in getting into social tensions. We have series of examples in Karnataka entering in to such debates. It is always a subject of contention to talk about the origin of Vijayanagar rulers, the Kadambas or the Chalukyas. It is a major thing of debate for scholars to prove the caste of kanakadasa. Normally it has spilled the boundries of academics and gone to the courts or publics or the politicians. Every community is trying to claim one or the other historical figure as belonging to their community. It could never be ignored because it has been raised by people outside the universities not by scholars engaged in academic exercise. So, it is clearly evident in contemporary Indian society that the communities which had no voice and visibility to go for caste identities. There is a long history behind such identity questions. Each and every small community as and when gets economic and social strength comes out with a rightful demand for their identities. For quite long it was the upper castes and dominant castes who had their say in the society. They also had their voice in academies. Dalit movement could bring in a momentum to the stagnant society, not only to go against caste exploitations but also to go in search of cultural roots. These roots were identified through the ruling dynasties, poets, saints and so on. They find solace in identifying historical personalities and look at them as cultural heroes. Many of our oral epics have helped these communities to look for a cultural hero. Kuruba community of Karnataka looks at kanakadasa as their cultural icon. Most of the Vachanacaras have been adored by specific castes to which they belong. I look at the work on Nandas by Dhanraj is another voice which is looking for a community to have pride in identifying a ruling dynasty as of its own. It is the sign of backward class identity question. In order to make it more authentic it demands further research making use of exhaustive number of primary sources. It is also a time for us to understand the polemics of caste. ‘Barber’ is a profession based caste, neither a tribe nor a linguistic group. Because of their skill based occupation and their proficiency it has to be studied in order to enter into the so called ‘epistemology’. An in-depth study of the community as well as the profession is required in order to bring them out of the social stigma they are suffering for centuries. India is a caste ridden society. In the formation of any kingdom, the kshatriyas and the Brahmins have dominated the caste hierarchy. But when I heard from Mr.B.Gopal, former President, BSP, Karnataka, that the Nandas who were great emperors (chakravatis) were shudras,that too they were Barbers, since I belong to Shudra community, I was rather curious. I began to reflect how could a very minor professional caste of barbers whose profession is hair cutting and shaving could produce such great rulers in the Indian subcontinent who laid the foundation for the shudra rule for the first time? That made me to go in search of the material. I went on referring number of books and I could collect some information. I tried my level best to collect more but I could not. Probably the early Brahminical writers were prejudiced against the shudras that too since the Nandas were barbers by profession. They did not want to highlight them. They called the Nanda rulers as “Adharmika” (irreligious). We do not get the historical evidence of all the Nine Nanda rulers. However we get information about Maha-padma Nanda who laid the foundation for the Nanda dynasty and about Dhana Nanda, the last Nanda ruler who was a contemporary of Alexander the Great. Apart from these two we do not get any information about the remaining seven Nanda rulers. Probably the historical evidences might have been destroyed by the Brahmin writers who were known for such things. In this book I have focused on Mahapadma Nanda. Since he was branded as a Shudra and the Brahmins called him an “Adharmika”, he took revengeful attitude. He destroyed all the kshatriya dynasties of his time and proved himself more capable than the kshartiya rulers. He kept Brahmins out of his rule and did not care to take them as his advisors. Instead, he kept the Jains. His military genius was so great, even the Brahminical writers wrote in the puranas, that there existed only Brahmins and the Shudras. The Brahmin Parashurama decimated all most all the Kshatriyas; those remained it is said were destroyed by Mahapadma Nanda. It shows that Shudra rulers can be greater and mightier than the Kshatriyas who were traditionally supposed to be fit to rule the country. Even Chandra Gupta Maurya who defeated the last Nanda ruler Dhana Nanda also comes from Nanda lineage, since he was the son of ‘Mura’ who was a concubine to one of the Nanda Kings. The Nandas were great administrators. The Nandas brought the smaller principalities under one rule with the help of their mighty army (Ekarat) and the country was unified as never before. This helped Chandra Gupta Maurya to establish his rule more effectively. The Nandas were the first people to introduce canal system of irrigation. Scientific forms of weights and measures were introduced. Though the Nandas ruled India only for a short duration of 100 years it was very effective and significant. The services barbers carry out are multifarious. The barbers were the first surgeons in our country. They give important service to society as barbers. They cut the hair and do shaving. We would have been barbarians in the absence of barbers who gave us agreeable look. The barber women have served as midwives and they are considered much more competent than modern nurses and doctors in midwifery. In addition to these services they play music on important festivities and marriages. They did the role of match makers during earlier times. In spite of these services the barbers were relegated to a low position in Hindu social hierarchy. Even today in many parts of rural India they are stigmatized, despised, and treated worse than dalits. Time of expending in the pro-capitalist cosmopalitan culture the space for caste-based professions is sinking especially in cities and towns. Modern laundries, tailoring, garment outfits and beauty parlours are some of the striking examples of this change. Yet the feaudalist mindset stigmatizing the barber caste is at work not only in rural parts but even in the media. The question naturally arises: should the barbers continue to remain in the Hindu fold. Is this the reward that they get for having given service to Hindu society. I feel that if the barbers decide to convert enmass to Islam or to Christianity, the caste stigma would vanish. They can gain social equality and become more progressive by embracing any other religion be it Indian or foreign. I am grateful to Prof. Gangadharamurthy B, former Head, Department of English, National College, Gauribidanur for having gone through the script with patience and for giving valuable suggestions. I am also indebted to Dr. Vasu M V, Associate Professor, Department of Post-graduate Studies in History, Bangalore University for writing a foreword to this monograph. I sincerely acknowledge the encouragement Mr. B.Gopal gave me in writing this book. THE NANDAS THE GREAT BARBER RULERS OF INDIA BY T.M. DHANARAJU. M.A. n this book I have focused on Mahapadma Nanda. Since he was branded as a Shudra and the Brahmins called him an “Adharmika”, he took revengeful attitude. He destroyed all the kshatriya dynasties of his time and proved himself more capable than the kshartiya rulers. He kept Brahmins out of his rule and did not care to take them as his advisors. Instead, he kept the Jains. His military genius was so great, even the Brahminical writers wrote in the puranas, that there existed only Brahmins and the Shudras. The Brahmin Parashurama decimated all most all the Kshatriyas; those remained it is said were destroyed by Mahapadma Nanda. It shows that Shudra rulers can be greater and mightier than the Kshatriyas who were traditionally supposed to be fit to rule the country. Even Chandra Gupta Maurya who defeated the last Nanda ruler Dhana Nanda also comes from Nanda lineage, since he was the son of ‘Mura’ who was a concubine to one of the Nanda Kings. Ambika prasad, Your comment is not clear. Are you looking for Bhaimi Vyakhya book or talks on Bhaimi vyakhya? Giving below link to Telugu translation of Mudrarakshasa.